Be a little different - Guerrilla Marketing Tips to sell your home! Be a little different – Guerrilla Marketing Tips to sell your home! Have you heard of guerrilla marketing? The term was coined and defined by Jay Conrad Levinson in his book Guerrilla Marketing and was invented as an unconventional system of promoting something, that relies on time, energy and imagination rather than a big marketing budget. Typically, guerrilla marketing campaigns are unexpected and unconventional, and consumers are targeted in unexpected ways and places. 1. If you have an unusual feature, design or story about your house, try to generate free PR by getting onto local radio or in the press. 2. Offer a financial referral incentive to all on your email contact list, and ask them all to pass it on. Make it a really worthwhile reward – several thousands of pounds – to make sure they get excited about it. 3.Leave your brochure between the pages of some of your used magazines, and then take them to doctors’ and dentists’ surgeries for their waiting rooms. 4. Attach a lidded, waterproof brochure box to your for sale sign so people can help themselves to your brochures when they are driving or walking past. 5. Your largest employers in the area will probably have noticeboards where you can pin a brochure, or at least an index card..
6. Put your asking price on your for sale board. This particularly works well on a busy road, or on the rear fence of a house that backs on to a playing field or park. 7. Have some small postcards printed with your property details and contact information; wherever you go, make sure you have some with you and can leave them in appropriate places. 8. Calculate the price per square foot of your house, and compare it to your competition; if it is favourable, print a table showing how you rank and make it available to buyers. 9.If you have a family house, make sure any children are well catered for, and encourage them to play on swings, slides, trampolines etc, leaving their parents free to look around in peace. Pester power can work a treat! 10. Follow the developers’ lead, and place some signs around the house detailing appliances and any other features, such as pull-down loft ladders and garage door remote switches. Men in particular, love any gadgets, and it gives them permission to try them out. 11. Ask your friends and neighbours to write some nice testimonials about the house, the neighbours and the village or town. Leave these printed out on the table for them to take with them. Include any interesting local stories and famous or celebrity residents. 12. Facebook sites are really easy to create – make one to showcase your house complete with local information, photographs, details about local stories and famous neighbours etc. Share the link with your email list, and add it to any marketing. 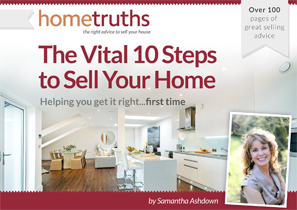 The message here is, don’t leave it all to your estate agent – there’s so much you can do. At the very least, you’ll feel that you have taken back some control of the marketing of your property – and at best, you might just find yourself a buyer! What to read next: Selling Your House – Your 20 Minute Weekly Workout!